Radio Shack: 23-021, 23021, 5SN-AAA70H-SV-P, 5SNAAA70HSVP -----. Lenmar: RBZ302MI. Interstate Batteries: ARAD0056. Hi-tech: 5R-US, 5RUS. Model: NAGOYA. BAOFENG: UV5R/Plus UV5RA/Plus UV5RE/Plus UV5RB UV5RC UV5RD UV3RPlus BF-320 BF-480 BF-490 BF-520 BF-V6 BF-V8 etc…. Suit For Frequency Range: VHF : 136~174MHz. UHF : 400~520MHz. Antenna Length: 39 cm. IC-F3000 F3001 F3002 F3003 F3010 F3011. FA-SC55V 6.5" VHF Antenna For ICOM Radio. Compatible With ICOM Models. For BaoFeng Radio: UV-5R, UV5RA, UV5RE, UV5R Plus, etc. Connector: SMA Male. For Kenwood Handheld Radio: TK-2107, TK-3107, TK-2260, TK-3260, TK-3160, TK-278, TK-378, etc. Material: Foldable Flat Steel. 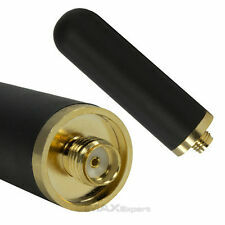 2dBi SMA-Female Dual Band Antenna 145/435MHz (1.8" Stubby). This 2dBi antenna give s you the convenience for close work with minimum exposure, yet it allows you to easily hit repeaters across the city through dense urban landscape. Diamond Antenna RH77CA HT/Scanner Antenna. CB & Scanner Antennas. Radio Accessories. Gain (relative): 6dB. 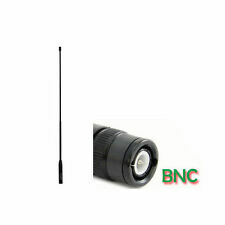 Connector: BNC Male. A little boy get his team jersey. A mom put food on the table. Why buy from us. motorola pm400 uhf. Condition is Used. Radios came from working environment digital upgrade Shipped with USPS First Class Package. I have more if your interested in a quantity discount. 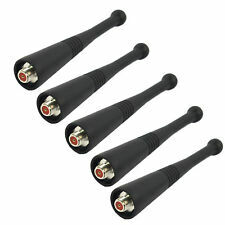 KENWOOD KRA-27 UHF WHIP ANTENNA TOTAL OF FIVE FOR SALE BY EACH. Condition is Used. Shipped with USPS First Class Package. The vehicle roof mount converts to high frequency applications (0-6000 MHz) by removing center pin. Pulse/Larsen NMO Mounting Kit. XPR2500 XPR4350 XPR4380 XPR4550 XPR4580. Compatible Motorola Models Desktrac bases or repeaters. Cable is 10 feet long. XTS1500 XTS2500 XTS3000 XTS5000 MTS2000. 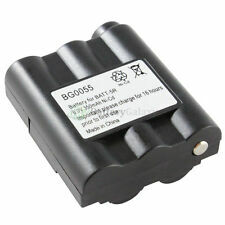 Compatible with Motorola APX4000 APX6000 APX6500 APX7000. MOTOROLA MOTOTRBO XPR 7550. THIS ANTENNA WILL FIT THE FOLLOWING RADIOS MOTOROLA MOTOTRBO XPR7550e. MOTOROLA MOTOTRBO XPR6100. MOTOROLA MOTOTRBO XPR6300. MOTOROLA MOTOTRBO XPR6350. MOTOROLA MOTOTRBO XPR6500. This bottom interface is made of TPU imported from Germany. ☆ VX451 VX454 VX459. Compatible with :Vertex Standard. UHF SMA Antenna. 400-470MHz (UHF ). ☆　SP50, SP10, P10, P50, P100, P110, P200, P210, P1225, P1225-LS. ☆　EX500, EX600, EX600-xls. UHF Antenna. 400-470 MHz (UHF ). Compatible with :Motorola. ☆　EP350, EP450. ☆ GP68, GP88, GP88S, GP328, GP338, GP338 PLUS, GP2000, GP3688. 1x OEM 8505241U04 Antenna. SMA Whip Antenna. ☹Can't fit motorola analog Saber I II III ,fit digital Saber. XTS1500 XTS2500 XTS3000 XTS3500 XTS5000. MTX8250 MTX8250·LS MTX9000 MTX-LS. MTX800 MTX838 MTX850 MTX850·LS MTX8000. 1x Stubby NMO Antenna. Each band has its own radio port. Motorola NAE6549A has been replaced by NAE6549AR. Works with: MT1500, PR1500, XTS3000, XTS3500,XTS1500, XTS2500, XTS5000. IC-F3020 F3021 F3022 F3023 F3026. Compatible with :ICOM. 136-174 MHz (VHF ). IC-F3000 F3001 F3002 F3003 F3010 F3011. $Frequency: 800 MHz Type: Whip Length: 6.75". NAD6502 HAD9338. VHF Heliflex Antenna. 136-174MHz (VHF ). For Motorola. Extension Length: 150cm(45in). Plug Type: SMA Male. Use the SMA Male Plug Walkie-talkie. 14mm 18mm Male Female Glass Adapter Joint Slide Bowl Extension various size UE. Type: Radio Antenna. Antenna Length: 20cm(8in). Frequency : 400 / 480Mhz. 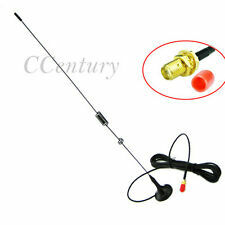 MINI SMALL SMA FEMALE UHF BAND RADIO ANTENNA. And Other SMA-F Connector UHF Radios, Scanners. Type : UHF Band Antenna. Gain : (2.15dbi UHF). PORTABLE HANDHELD RADIO ANTENNA. 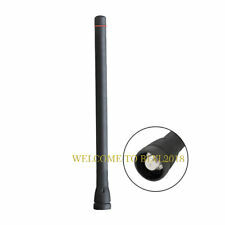 1 Pcs MINI SMA-F Antenna. TK2300 TK2302 TK2306 TK2307 TK2312 TK2360 TK5210 TK5220. VHF Antenna. 136-174MHz (VHF ). Compatible with :KENWOOD. Baofeng BF-888S UV5R. New Billet Aluminum Low Profile Napa 4003 Wix 24003 Fuel Filter 1/2-28" 1/2" UE. 14mm 18mm Male Female Glass Adapter Joint Slide Bowl Extension various size UE. Kenwood TK3107 3207. Baofeng BF-888S UV5R. Kenwood TK3107 3207. 5x Universal Waterproof Case Bag For Motorola HYT Kenwood Icom Radio Green US. Type: UT-108UV Antenna. 200Pcs Glass Fuse Tube Axial With Lead Wire Fast Blows Fuse 3x10mm 250V/1A US. Antenna type: Non-stretched. 1Pc x Antenna. Connector: SMA-F Female. Band: Single band. Also note that monitor settings may vary from computer to computer and may distort actual colors. If you have any problems, we are very glad to help you. Compatible with Motorola GP300. front outer case. XTS1500 XTS2250 XTS2500 XTS3000 XTS3500 XTS4250 XTS5000. UHF Flexible whip Antenna #NAE6549. 403-520 MHz (UHF ). UHF Band, Flexible whip antennas 403-520 MHz - "Light grey" Color Code 133mm Length. Wideband antennas are ideal when the radio is used in different frequencies since one antenna will cover all ranges. IC-F4000 F4001 F4002 F4003 F4010 F4011. IC-F4020 F4021 F4022 F4023 F4026. Compatible with :ICOM. UHF Antenna. 400-470 MHz (UHF ). VX168 VX170 VX177 VX180 VX210 VX228 VX230. Compatible with :Vertex Standard. 136-174 MHz (VHF ). VX150 VX151 VX152 VX160 VX110 VX130 VX131 VX132. Dantona: COM-BP38, COMBP38. Empire: FRS-008-NH, FRS008NH. Radio Shack/Tandy: 21-1926, 211926. High Quality! ☆　SP50, SP10, P10, P50, P100, P110, P200, P210, P1225, P1225-LS. ☆　PR400, PR860. UHF Antenna. 400-470 MHz (UHF ). Compatible with :Motorola. ☆　EP350, EP450. ☆　EX500, EX600, EX600-xls. ☆　CP040,CP140, CP150,CP160,CP180, CP185,CP190, CP200. CLS1810T (Target radios). Radius VL50.